The line “Industrial Web” is made of non-woven web manufactured with technologically advanced Rando equipments using top-quality nylon, spray-coated with high performance resins and minerals. 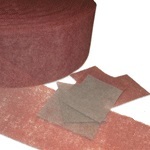 The employed minerals include Aluminum Oxide and Silicum Carbide having different grits able to satisfy every requirement of the main industrial applications. The main features of these products enable their use on both wood and metal, mainly converted in the most common shapes such as discs, ventilated, flap or convolute wheels and hand pads. 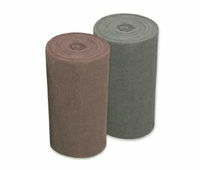 The products may be supplied in rolls or cut rolls, sheets sized 2x1m or pads of different sizes. This range is produced with traditional spraying techniques. These fibres are suitable to be converted into tools such as discs, flap, convolute or ventilated wheels and, consequently, used in the main industrial processes like deburring, satin-finishing, surface finishing, polishing of workpieces in a wide variety of materials, for example metal, wood or plastic. The impregnation process enhance the resistance of the base Webs. This line, in constant evolution, displays some specific grits as shown in the enclosed table, tailored upon customers’ demands. 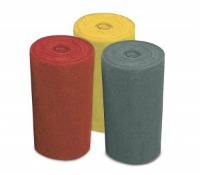 Thanks to their features, these products are the most suitable to be converted into floor pads and flap wheels. These products are manufactured on supports of a very thin thickness thus ensuring the utmost lightness and conformability. They are mainly turned into shapes fit to be manually processed or converted into special wheels. The line is available in several grits as displayed in the enclosed table. These lines have been mainly conceived for manual processes. 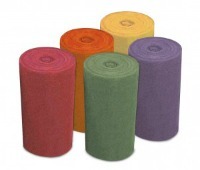 They are manufactured in non-woven web employing both advanced Rando technology and carding machine. Their main features are conformability, elasticity, softness joined to excellent finishing and resistance performances.